In tête-à-tête with Restaurant India, Executive Chef at The Lalit, Chandigarh, Nandita Karan speaks how chefs could help contribute towards the development of the restaurant industry in India, and how she abides by the back-to-roots concept. 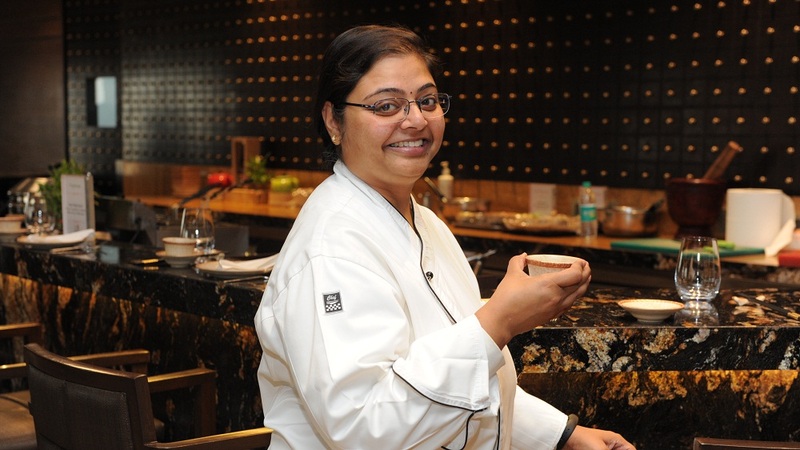 Executive Chef at The Lalit, Chandigarh, Nandita Karan wanted to take up a ‘glamorous job’ but she says her love for food led her to the ‘world of cooking’. Chef Nandita has been associated with the Food and Beverage industry for past 16 years. In a tete-a-tete with Restaurant India, Chef Nandita Karan speaks how chefs can help contribute towards the development of the restaurant industry in India and how she abides by the back-to-roots concept. It’s been 16 years in the industry. I’d studied from IHM Patna. Though I was a foodie from the beginning, I didn’t know I’ll turn in to a chef one day. It all happened suddenly. I had always wanted a very glamorous job like front office, wearing saree, and standing at reception; that used to fascinate me but simultaneously I loved cooking, eating and trying out new food. When I went for my first interview, I got an inferiority complex that I am not beautiful, and don’t stand anywhere as compared to other IHM girls - they were very well maintained. And at that time I just cut out the idea of front-office and went for the food production; the decision changed my life. I gave my food trials at The Oberoi Rajvilas, the first hotel where I worked and got selected from among 200 people. And then the journey as a chef started. I had also worked with Grand Hyatt Mumbai, Hilton in London and Chef Jamie Oliver. And, then, I joined The Lalit, Chandigarh, as an Executive Chef. "I am basically, a continental chef. But if you talk about the personal choice and come to dine in with me, I’ll treat you with the home-style cooked food." In outside countries, the restaurants are much advanced. Even they have a lot of freedom to do different things they are doing very well as compared to India. The restaurant industry in India is not as developed as the businesses abroad. If there are good restaurants in India, they are somehow associated with hotels, most of the time. Many chefs are now taking the lead and coming up with their own businesses in India. If you compare the scenario from the outside countries, they are more into the restaurant business and are not attached to any hotels. My approach is not much of modern. I love my roots and traditional foods. The concept of organic food, from farms to table came into my mind while working with Chef Jamie Oliver. We used to have our own kitchen garden at the Jamie Oliver restaurant. And we had tie-ups with local farmers who used to supply us vegetables and other materials. When I came to India, I found the tradition which was earlier in the country was a much better concept. Though we are heading towards fast food, modernization is there; people are eating chemically-treated food which just lasts for a smaller time. In the long run, traditional and back-to-root cuisines are good enough. I love all those foods which my mother or grandmother would have cooked; that’s healthy, nutritious, not very fatty and are good options. People are introducing modernizing food, fusion food is there, a lot of Mexican, Spanish cuisines, yet they are still not taking up the back-to-basics menu at their restaurants. We should promote our regional cuisines. There are a lot of region-based cuisines in India which are not yet known by many people in the country itself. So, chefs should come up with our regional cuisines also rather than copying from other cultures. We should promote our food. If you really love food and have creativity within, start your own options or your own restaurant business. Serve good food to the people. Do whatever is in your heart. Don’t go with somebody who is teaching you to go in a particular way or choose something which you may or may not like. Start your own things. My grandmother would teach me about zero wastage food, and that was 30 years back. I am promoting such dishes only. Seeing the condition in our country where a lot of people sleep hungry, everyone should come up and promote zero wastage food, and also use all those organic food. 5 Growth Strategies For Restaurant Startups..